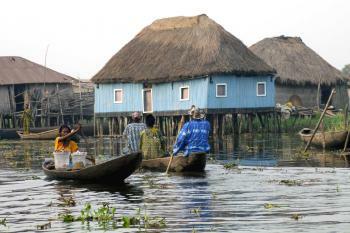 Site Lacustre de Ganvi is part of the Tentative list of Benin in order to qualify for inclusion in the World Heritage List. There is a bit of competition around now for the first lacustrine “Stilt village” inscription! Ghana placed Nzulezu Stilt settlement on its T List in 2000 and Brunei seems likely to put Kamphong Ayer on its initial T List soon. Myanmar, on the other hand, seems to have given up with the Inle Lake villages! Ganvie has been on Benin’s T List since 1996. We visited it in 2007 and had another chance to do so in 2012 when we revisited the country – but chose to revisit a non T List area as being more interesting! Nevertheless most visitors to Benin are going to visit Ganvie. This town of c 20k people is situated on/in Lake Nokoue - a 20 x 11km lake which exits at its south side to the sea through Cotonou. Ganvie is on the north side, and the normal way of approaching is via the rather grotty town of Abomey Calavi (Virtually a suburb of Cotonou) to the west where small boats (romantically described as “pirogues”!) ferry inhabitants and tourists to/from the village. After a few kms of open water, the boat enters an area of canals and “floating islands” – actually fully “tethered”, but constructed from piles, lake mud and vegetation. These are used for both the building of houses and agriculture. Many of the latter are under water for 4 or 5 months each year. There are a few dwellings in “original” form on stilts with wood and thatch, but a large number now are made of concrete with some more traditional “huts” as adjuncts! Water tanks, satellite dishes and signs to the many restaurants and hotels which have sprung up to cater for this “gem” of Benin tourism now detract from the historical authenticity. We stayed overnight in one of the hotels – which was at the lower end of our “African hotel experiences” across some 2/3rds of the countries in that continent! It was interesting to see the faeces from our “en suite” bathroom depositing themselves into the shallow water beneath our hut! Never mind – the next rainy season will wash it all further in and there are no doubt plenty of “bottom feeders”. A place to be careful of one’s hygene and what one eats! I am not sure that an overnight is really justified. If the nomination ever comes to fruition, the town of Ganvie would be joined by its wider lacustrine environment and its “ecosystème autonome” – presumably as a “Cultural Landscape”? Its OUV would be entirely cultural - although there are birds etc on the lake there are more significant wild life areas further along the coast. But how much OUV does it possess? The T List introduction refers to the “modifications et innovations apportées a l'habitat traditionnel par le modernisme” but claims that the essential civilization with its “architecture très originale” remains. Benin is aiming high - I rather liked this extract from the T List blurb “Le site lacustre de Ganvié avec ses îlots peut être compare a la ville italienne de Venise,”! !